I am a Licensed Acupuncturist (NC#582) and a Licensed Acupuncture Physican, Doctor of Oriental Medicine (FL#3165) with over 3,000 hours of didactic and clinical training in Acupuncture and Chinese Herbal Medicine. 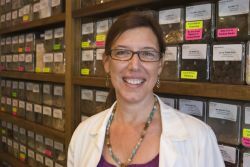 I am also National Board Certified in both Acupuncture and Chinese Herbology by the National Certification Commission for Acupuncture and Oriental Medicine. (NCCAOM Dipl.O.M.) I graduated from the Jung Tao School of Classical Chinese Medicine in Sugar Grove, North Carolina in 2010, where I received four years of post-graduate training in the lineage of the great acupuncture master, Dr. Nguyen Van Nghi, who has been credited as a prominent force in bringing classical Chinese medicine to the West. Other certifications include Acupuncture Detoxification Specialist through the National Acupuncture Detoxification Association (NADA) and certification in Clean Needle Technique by the Council of Colleges of Acupuncture and Oriental Medicine. I am certified in Chinese Herbal Studies from the Academy for Five Element Acupuncture in Gainesville, Florida. My undergraduate degree is in Biological Sciences from the University of Maryland Baltimore County. I am also a Licensed Massage and Bodywork Therapist (NC#1661) and graduated from the Southeastern School of Neuromuscular and Massage Therapy of Charlotte in 1998. I have advanced certification in Reflexology, Myofascial Therapy, Medical Massage and as a Reiki Master with over 20 years of experience working in the healing arts profession.